Some people tell stories about the Beyond. Some expect help from the Beyond. Rubailar, Rubai #4, Page 222. This entry was posted in quatrain (rubai), Rumi Poetry and tagged God, Humanity, Love, Nothingness, Soul on February 17, 2019 by Millicent. O player, play this music. Play this tune. Alas for the ones who block the road! Mercy especially for the one who waylays us on our road! This entry was posted in Gazel (longer poem), Rumi Poetry and tagged Absence, Existence, Joy, Nondualistic Perception, Patience, Soul, Suffering on December 2, 2018 by Millicent. Every mind becomes confused when it sees Your face. Every face is scratched by Your Absence. I have become drunk because of Your reproach. This entry was posted in Gazel (longer poem), Rumi Poetry and tagged Absence, Beloved, Divine_Wine, God, Mind(Reason), Praise, Separation, Soul, Suffering on November 18, 2018 by Millicent. The words which come from the soul are a curtain to the soul. The fog which comes from the sea hides the coast and the pearls of that sea. It is a great task to get involved in philosophical discourses. This entry was posted in Gazel (longer poem), Rumi Poetry and tagged Curtain, Existence, God, Self, Soul, The Earth, The Sea, Truth on October 7, 2018 by Millicent. This entry was posted in Gazel (longer poem), Rumi Poetry and tagged Absence, Body, Existence, Heart, Soul, The Journey on August 26, 2018 by Millicent. From now on, you are starting a new life altogether. This entry was posted in Gazel (longer poem), Rumi Poetry and tagged Body, Resurrection, Soul, Truth on August 12, 2018 by Millicent. Tonight, take my soul completely from this poor body. This entry was posted in Gazel (longer poem), Rumi Poetry and tagged Absence, Annihilation, Divine_Wine, Soul on June 17, 2018 by Millicent. One day your heart will take you to the One who caught your heart. One day your soul will take you to the Beloved. Don’t let go of the skirt of your pain. One day your pain will take you to the Remedy. This entry was posted in quatrain (rubai), Rumi Poetry and tagged Beloved, Heart, Patience, Soul, Suffering, The Journey on June 10, 2018 by Millicent. You are coming our way. You are a decent person. but we are the Fountain of Life for you. You are a small pigeon. You were born in this nest. If you don’t come this way on your own, we will pull you by force. becoming drunk on His wine, the wine that comes only from Him. We stand at our place like a mountain, but we flow like a torrent. We keep silent like that, but sometimes yell and scream like thunder. you have a soul that resembles the sea. Put it in your palm and come to us. Our part of ownership of these five senses is only a short five days. But, there are six dimensions and we are a sultan in each one of them. We are following the shrill pipe of Love. because we keep playing the vessel of the soul, crying for you. You concern yourself with the matters of Love. If you are sincere, don’t look for a bed and a pillow. We have welcomed this illness caused by our desire to reach the Mine. We haven’t welcomed it out of love for a bed and pillow. 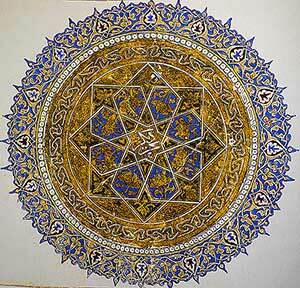 The light of the sky, the praise of Tebriz is our Shamseddin. and the self has become the Moon. Divan-i Kebir, Meter 10, Gazel 71, Verses 749-757, Pages 155-156. This entry was posted in Gazel (longer poem), Rumi Poetry and tagged Annihilation, Comfort, Divine_Wine, Love, Self, Soul, Suffering, The Journey on June 3, 2018 by Millicent. People were born from the Sea of Soul like water birds. How do those birds which come from the sea make this place their home? We are engulfed by the soul’s sea with every breath we take. This entry was posted in Gazel (longer poem), Rumi Poetry and tagged Annihilation, Body, Drunk, Exuberance, Heart, Soul, The Sea, Union on April 15, 2018 by Millicent.